After waiting 11 long months for the most anticipated trip of the year, we were finally on our way to Singapore Changi Airport, Terminal 1. We'll be gone for 16 days and it will be the longest trip to date for the girl and I. It is also the furthest that the girl and I have ever travelled (i.e. Scotland). The mum and hubby have previously visited the USA separately. Although we usually prefer to focus on at most 2 countries per visit, this is the first time that we'll be visiting more than 2 countries in one trip. This is so that we won't be spending most of our time travelling. However, as I've been to London in 2014, I was keen to explore other parts of the UK and Europe! Now what's the difference between England, Great Britain and United Kingdom (UK)? We decided to fly by Emirates because they offered really irresistible promotional prices during the Emirates Global Sale in January this year. It cost us only S$961.10 per adult and S$864.10 per child for return flights to London/Paris (arrival at London, departure from Paris). The downside, of course, was the hassle of transiting at Dubai. However, we all thought that the low price justified the extra travel time (18 hours 20 minutes versus 13 hours direct flight). We arrived at Changi Airport at around 10.30pm because we wanted to take pictures with the decorations and let my girl have fun at the playground. The 7.5 hours flight was supposed to depart Singapore at 1.20am but due to various delays, we didn't take off until 3am! As a result, we landed in Dubai International Airport later than we had anticipated. The good of it all was that our transit period was shortened from 3 hours to 1 hour but that meant that we had to rush from one gate to the other during transit! We arrived safely at London Heathrow Airport Terminal 3 after 8 hours on the plane from Dubai. We were so exhausted after our almost 19 hours journey from Singapore to London! It also did not help that London is 8 hours behind Singapore (during winter), which meant that although it was only 12 noon in London, it was already night time in Singapore. As with our previous London trip, we booked our airport transfer from BA Transfer (you can also consider other alternative airport transfers that I've listed in my London 2014 Itinerary). The cost of travelling from Heathrow to Hammersmith was £48. We quite liked the ride, which was spacious and had enough boot space for our luggage. Our accommodation for our stay in London was Luma Concept Hotel Hammersmith, a newly renovated hotel located in our favourite town of Hammersmith. We had stayed at Hammersmith in another hotel previously and really loved it so we decided to stay at Hammersmith again. We chose Luma Concept Hotel as it was newer and cheaper than the previous hotel. We booked the Family Room via Agoda as the website stated that it can accommodate 4 adults. We had expected one big room but it turned out to be TWO connecting regular rooms! 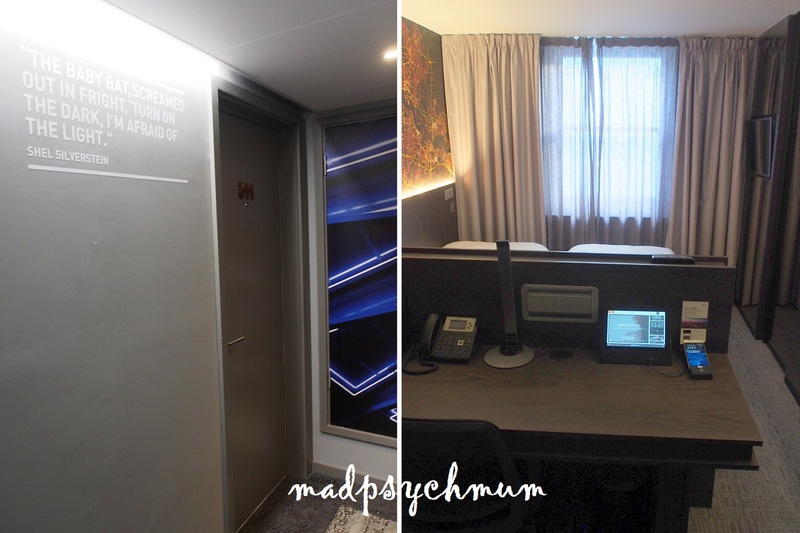 At just S$284 for both rooms per night, it was really value-for-money! 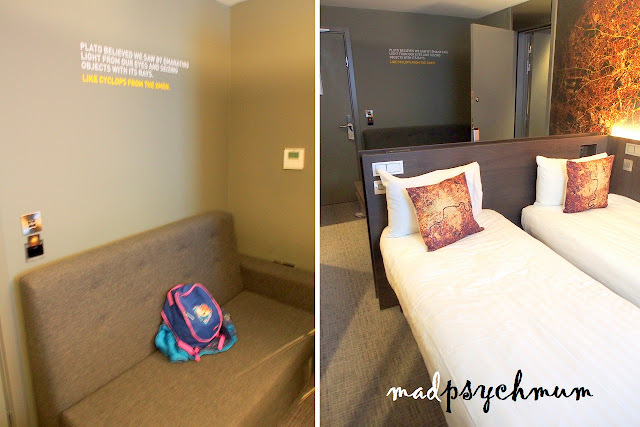 Right: You'll see the table when you walk in, with the bed hidden behind it. Sliding doors with mirrors on the side of the room hide the shower, cupboards and toilet! It is a pretty smart way of making a tiny room look bigger and more spacious. 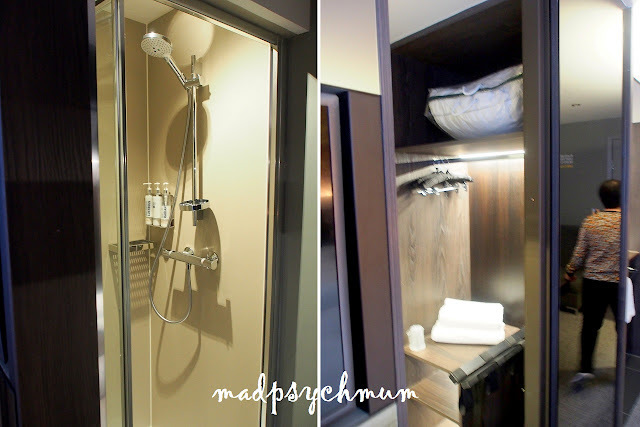 The hidden shower and closet space was really tiny but usable. I managed to store my medium-sized luggage in there. Right: The connecting door next to the sofa and table opens up to the room next door. The hubby and mum were most excited by the Nespresso machine in the room! They both drank at least 3 cups of coffee a day! Do note that although our room comes with breakfast, it is the Grab and Go type because the hotel does not have a restaurant for sit-down buffet breakfast that we're used to. I'm a mega fan of croissants and can eat them every morning so that's ok with me. What's not so ok is the drink and fruits, which I got sick of after a while. Enough of orange or apple juice, I'll have my Teh-C Peng please, thankyouverymuch! King's Mall houses many of our favourite shops such as Primark, Sainsbury, Wilko, Tiger and Pound land. Primark in Hammersmith, my favourite shop in UK!! Primark recently released a whole Harry Potter range which ignited the fan in me! I bought so much Harry Potter merchandise for dirt cheap prices!! Woohoo!! Don't forget to ask for tax refund on certain goods (do ask the shop on which items are considered). You can get tax refund at any EU international airports, if you spend a minimum of £30 in the UK. Connectivity on two handphones, both can be used independently. Allows for WhatsApp calls between one phone and the other. Looking forward to more fun tomorrow!